There’s no good reason for this edition to exist. The game is simply a restyled Life board game with different words in place of the original. The gameplay is identical and the designers were very lazy. It’s not even licensed to a real band — how lame is this? Avoid, unless you MUST have one of each version out there. Always be sure to check the current eBay prices — you’ll often save big money over the Amazon price. See more Game of Life editions and accessory reviews. 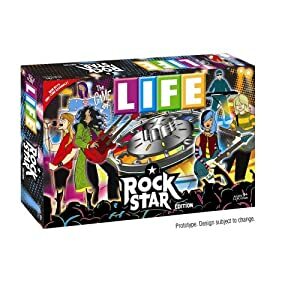 If you own Rock Star Life board game, please rate it by clicking on the Comments link below the eBay listings.